LTI provides a framework through which an LMS (Canvas) can send some verifiable information about a user to a third party. For LTI to work, the third party needs to provide a consumer key and shared secret that Canvas can use to generate a signature to verify the authenticity of the data sent. By default most user information is anonymized, but this can be changed when the configuration is first set up. External Apps can be configured on the account or course level. When would I use an External App? External Apps add functionality to a Canvas course. For example, an instructor may want to include a study aid (flashcards, mini-quizzes, etc.) to help students better understand the concepts being taught. Admins can add external apps for accounts and subaccounts via XML, URL, or manual configuration. If apps do not already exist for a course, instructors can add external apps in their courses to create additional learning paths for students. External apps can be added to Modules, Course Navigation, the Rich Content Editor, and Assignments. In the Rich Content Editor, icons for external apps display in the order that they are configured. When would I use the Canvas App Center? 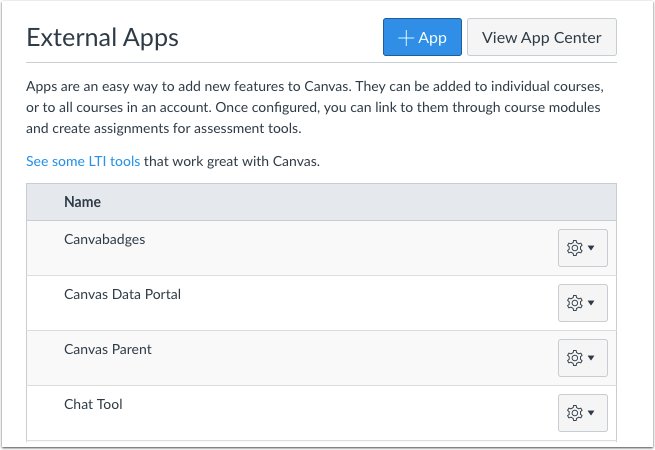 Admins and instructors can also enable apps through the App Center, which is integrated directly in Canvas. The App Center is part of the Apps tab in both Account and Course Settings. 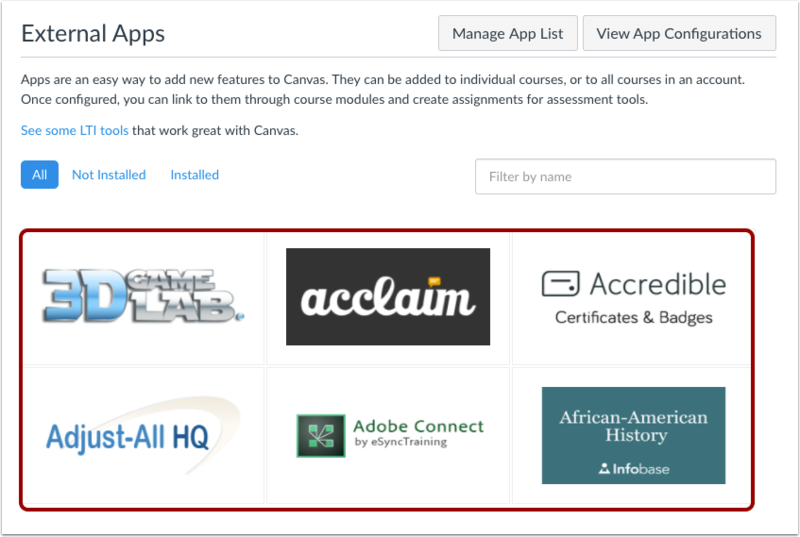 Admins can manage the apps that can be used in courses for accounts and subaccounts by creating a whitelist in the Edu App Center and managing the whitelist in Canvas. Table of Contents > Canvas Features > What are External Apps (LTI Tools)?